Eastern Painted turtle rest at the edge of a puddle at Elk Forest WMA. The Eastern Painted Turtle (Chrysemys picta) is the Maryland regional sub-species of the painted turtle which has Midland, Southern and Western relatives living in other parts of the United States. 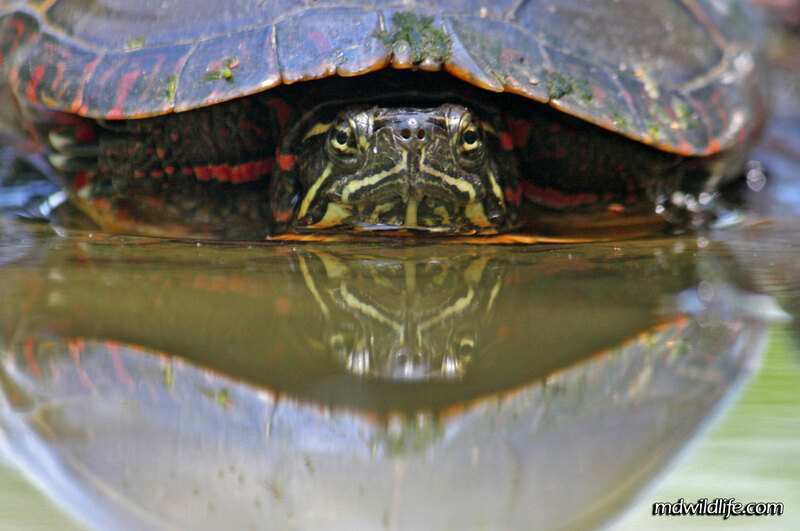 The painted turtle likes still ponds and waters, or marshes, rivers where it will bask on rocks or logs. In some areas, they may be found walking across roads, but usually prefer the safety and comfort of water. The painted turtle’s size and markings make it very similar to slider family of turtles, particularly the red-eared slider. A key difference is the Eastern Painted turtle has its red marking further back on on the head, away from its ears, and gold yellow streaks on its face. The painted turtle also has red markings on its legs and along the the perimeter of its shell. Top view of an Eastern Painted turtle. The top of the eastern painted’s shell is divided into several large segments and the bottom of its shell is a bright yellow color. The image above was taken at Elk Forest WMA. I had just walked the trail and was getting ready to leave when an older gentlemen pulled up in his pickup truck and dropped the turtle off by a shallow puddle. He told me he found him in the road and didn’t want it getting run over. That was nice of him. So I took a few minutes to take some shots. 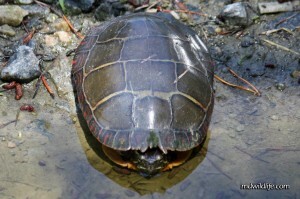 There’s a great page on eastern painted turtles at the Chesapeake Bay Program site. I follow these guys on twitter too and they post pretty good stuff, so check them out if you can.